Triple Play is played on a 54’ by 27’ carpeted field. The game is played by two alliances, each consisting of three robots. There are 9 three dimensional tetrahedral shapes located in a 3 by 3 grid throughout the field. The scoring objects for the game are three dimensional tetrahedral shapes (“tetras”), approximately 28 inches high and 8.5 pounds. Robots attempt to stack tetras on top of goals on contain tetras inside of goals, worth 3 points and 1 point respectively. A goal can be owned by an alliance if the highest tetra in a stack is their alliances colour. Additionally, a row of three owned goals in any direction (similar to a tic-tac-toe board) at the end of the match is worth 10 points for the alliance. 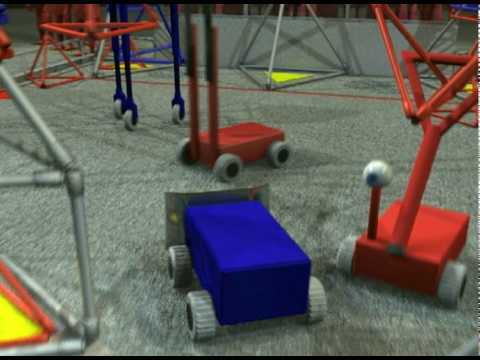 At the end of the match, an alliance can earn an additional 10 points if all of their robots finish in the designated end zone at the conclusion of the match. After two successful seasons in FIRST, Simbotics realized it was time to start spreading FIRST to the rest of the Niagara Region. With limited resources, the team knew expansion would be difficult. A creative strategy was needed. From this line of thinking, NiagaraFIRST was born. NiagaraFIRST is an organization that supports and funds FIRST teams in the Niagara Region. NiagaraFIRST.org uses creative and collaborative strategies to minimize development, manufacturing, and travel expenses, allowing for smaller allocation of resources to support a greater number of FIRST teams. By uniquely managing mentor support and financial resources, NiagaraFIRST was able start two new FRC teams in the region. Team 1503 (Westlane SS) and Team 1680 (Fort Erie SS) became the newest members of the NiagaraFIRST community. The 2005 robot, Simbot "Kevin" was named after the late Kevin Heins, a young Simbot who had passed away in a tragic accident that January. Simbot Kevin started the year slowly, but finished strong bringing home the gold with a regional victory in Toronto. Chairman's Presenters: Emerald C., Jeff B.